Ever since the Balfour Declaration in 1917 gave the formal approval of the British government to the establishment of ‘a Jewish homeland' profound issues of legitimacy were present in the conflict recently known as the Israel/Palestine Conflict. This original colonialist endorsement of the Zionist project has produced a steady erosion of the position of the Palestinian people on historic Palestine , which dramatically worsened over the course of the past 43 years of occupation of the West Bank , East Jerusalem , and the Gaza Strip. It has worsened due to an oppressive military occupation by Israel that involves fundamental denials of rights and pervasive violations of international humanitarian law, and because Israel has been allowed to establish ‘facts on the ground,' which are more properly viewed as violations of Palestinian rights, especially the establishment of extensive settlements and a separation wall constructed on occupied Palestinian territories in violation of the Fourth Geneva Convention. These developments have been flagrantly unlawful, and made the whole treatment of the Palestinian people illegitimate, as well as the occasion of continuous intense and pervasive suffering. For decades, the Palestinian political forces have exercised their right of resistance in various ways, including the extraordinary nonviolent Intifada of 1987, but also engaging in armed resistance in defense of their territory. The Palestinians definitely enjoy a right of resistance, although subject to the limits of international humanitarian law, which rules out deliberate targeting of civilians and non-military targets. Such tactics of resistance challenge Israel at its point of maximum comparative advantage due both to its total military dominance, achieved in part by large subsidies from the United States , and to its ruthless disregard for civilian innocence. In recent years, especially beginning with the brutal experience of the Lebanon War of 2006 and even more dramatically in the aftermath of the Israeli Invasion of Gaza in 2008-09 (Dec. 27, 2008-Jan. 18, 2009), there has been a notable change of emphasis in Palestinian strategy. The new strategy has been to initiate what might be described as a second war, ‘a legitimacy war,' that is essentially based on the reliance on a variety of nonviolent tactics of resistance. Armed resistance has not been renounced by the Palestinians, but it has been displaced by this emphasis on nonviolent tactics. The essence of this legitimacy war is to cast doubt on several dimensions of Israeli legitimacy: its status as a moral and law abiding actor, as an occupying power in relation to the Palestinian people, and with respect to its willingness to respect the United Nations and abide by international law. Those that wage such a legitimacy war seek to seize the high moral ground in relation to the underlying conflict, and on this basis, gain support for a variety of coercive, but nonviolent, initiatives designed to put pressure on Israel, on governments throughout the world, and on the United Nations, to deny normal participatory rights to Israel as a member of international society. These tactics also aim to mobilize global civil society to exhibit solidarity with the Palestinian struggle to achieve legitimate rights, taking the principal form of the Boycott, Divestment and Sanctions Campaign (BDS) that operates throughout the entire world, which serves as a symbolic battlefield. But there are other forms of action, as well, including the Free Gaza Movement and Viva Palestina that aim specifically at symbolically breaking the blockade of food, medecine, and fuel imposed in mid-2007, a form of collective punishment that has caused great suffering for the entire 1.5 million population of the Gaza Strip, damaging the physical and mental health of all those living under occupation. Although the UN has been a failure so far as offering protection (beyond its essential role in providing humanitarian relief in Gaza ) to the Palestinians under occupations or even in relation to the implementation of Palestinian rights under international law, it is a vital site of struggle in the legitimacy war. The whole storm unleashed by the Goldstone Report involves challenging the UN to impose accountability on the Israeli political and military leadership for their alleged war crimes and crimes against humanity associated with the Gaza attacks at the end of 2008. Even if the United States shields Israelis from accountability pursuant to the procedures of the UN, including the International Criminal Court, the confirmation of allegations of criminality by the Goldstone Report is a major victory for the Palestinians in the legitimacy war, and lends credibility to calls for nonviolent initiatives throughout the world. The Goldstone Report also endorses ‘Universal Jurisdiction' as a means to gain accountability, encouraging national criminal courts of any country to make use of their legal authority to hold Israeli political and military leaders criminally responsible for war crimes and crimes against humanity. Tzipi Livni, the current Kadima opposition leader in Israel, who had been Foreign Minister during the Gaza attacks, canceled a visit to Britain after she received word that a warrant for her arrest upon arrival had been issued. Even if Israeli impunity is not overcome, the authoritativeness of the Goldstone Report lends weight to calls around the world to disrupt normal relations with Israel by boycotting cultural and academic activities, by disrupting trade relations through divestment moves or through refusals to load and unload ships and planes carrying cargo to or from Israel, and by pressuring governments to impose economic sanctions. The historic inspiration for this legitimacy war is the anti-apartheid campaign waged with such success against the racist regime that ruled South Africa during the late 1980s and early 1990s. Undoubtedly the Palestinian political motivation to focus their energies on waging a legitimacy war came from a variety of sources: disillusionment with efforts by the UN and the United States to find a just solution for the conflict; realization that armed resistance could not produce a Palestinian victory and played into the hands of Israeli diversionary tactics by making ‘terrorism' the issue; recognizing that the events in Lebanon and Gaza generated throughout the world widespread anger against Israel and sympathy for the Palestinians, which is gradually weakening earlier European and North American deference to Israel due to Jewish victimization in the Holocaust; and a growing sense that the worldwide Palestinian diaspora communities and their allies could be enlisted to join in the struggle if its essential nature was that of a legitimacy war. Israeli official and unofficial support groups have recently recognized the threat posed to their expansionist settler colonial grand strategy by this recourse by Palestinians to a legitimacy war. Israeli think tanks have described ‘the global justice movement' associated with these tactics as a greater threat to Israel than Palestinian violence, and have even castigated reliance on international law as a dangerous form of ‘lawfare.' The Israeli Government and Zionist organizations around the world have joined in the battle through a massive investment in public relations activities that include propaganda efforts to discredit what is sometimes called ‘the Durban approach.' As with other Israeli tactics, in their defensive approach to the legitimacy war, there is an absence of self-criticism involving an assessment of Palestinian substantive claims under international law. For Israel a legitimacy war is a public relations issue pure and simple, a matter of discrediting the adversary and proclaiming national innocence and virtue. Despite its huge advantage in resources devoted to this campaign, Israel is definitely losing the legitimacy war. Even if the Palestinians win the legitimacy war there is no guaranty that this victory will produce the desired political results. It requires Palestinian patience, resolve, leadership, and vision, as well as sufficient pressure to force a change of heart in Israel , and probably in Washington as well. In this instance, it would seem to require an Israeli willingness to abandon the core Zionist project to establish a Jewish state, and that does not appear likely from the vantage point of the present. But always the goals of a legitimacy war appear to be beyond reach until mysteriously attained by the abrupt and totally unexpected surrender by the losing side. Until it collapses the losing side pretends to be unmovable and invincible, a claim that is usually reinforced by police and military dominance. This is what happened in the Soviet Union and South Africa , earlier to French colonial rule in Indochina and Algeria , and to the United States in Vietnam . It is up to all of us dedicated to peace and justice to do all we can to help the Palestinians prevail in the legitimacy war and bring their long ordeal to an end. 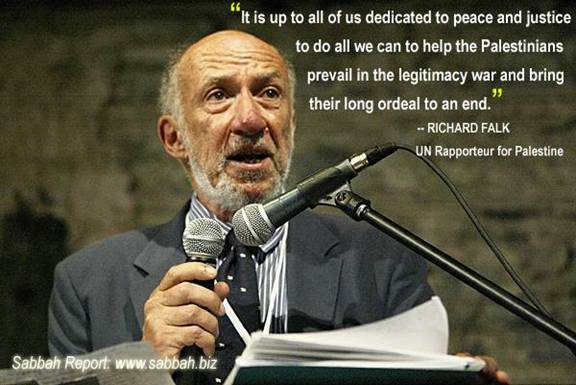 Richard Falk , Professor Emeritus of International Law at Princeton University and author of “Crimes of War: Iraq ” and “The Costs of War: International Law, the UN, and World Order after Iraq ” is also, current UN Rapporteur for Palestine . Was Israel Ever Legitimate ?